Since I started interning at Clallam County Health and Human Services, I’ve had the chance to work with my colleagues from nearly every department in the environmental health division. Some fun things I’ve done include going out to the water to collect shellfish, taking water samples on the Olympic Game Farm, and participating in an all-day state partnering session. Collecting shellfish was great because I was able to spend time out in the sun and on the beach. This is where I fell in love with Port Angeles. The work we do on the beach helps to maintain world-renowned recreational and commercial shellfishing opportunities. This in turn helps boost the local economy through license sales and allows people to spend time by the water and experience what the Pacific Northwest has to offer. Taking water samples at the Olympic Game Farm was great because I got to see and work around the many species of animals they harbor. One of our sample locations was within 10 feet of a grizzly bear enclosure, so the only thing standing between the sample crew and the grizzlies was a 5-foot wire fence and our guide. The work we do around the creeks of the farm also plays an important role in regards to shellfishing. I attended the Clean Water Workgroup Meeting recently and heard that some of the most productive waters in our local bay that have been historically off limits might be re-opened for harvesting in the near future! It’s great to know the work we are doing is making a positive impact. The state partnering session was a very valuable experience because I learned about specific processes to get work done in the county. People attended from the Washington State Department of Health, Clallam County policy makers, nation-wide building contractors, engineers, and other technicians to collaborate on streamlining the process to renovate the William Shore Aquatic Center. A partnering specialist was hired to facilitate the session, and she mentioned that meetings like this are rather new and uncommon, so the experience was cutting-edge in terms of collaboration. As an intern, I also appreciated the lunch! My proudest accomplishment during my internship was completely revamping the Clallam County shellfish page. It took many hours of study and collaboration with others in the county and throughout the state to produce the most comprehensive, accurate, and user-friendly web experience that I could. I’ve also worked on a project to assess the wildfire smoke health-risk communication needs of Clallam County organizations serving vulnerable populations. In order to make this an awesome experience, I needed my knowledge from UW, as well as a willingness to try new things and push to find relevant environmental health activities. During my internship, I received support from many people: it came from my housing hosts who were very accommodating to all my living needs; from my Environmental Health Director and EHREP program coordinators who officially instated me as an intern; from my UW Career Services and Internship Manager who provided guidance to all UW EH interns on how to make the most out of the experience; from the wonderful, intelligent, talented staff I worked alongside; from the partners of Clallam County including the locals, the state, and our national funding partners whose support makes our work possible; and my family who helps to support my housing in Seattle. This entry was posted in Uncategorized and tagged 2018, Clallam County on October 5, 2018 by deohsjob. 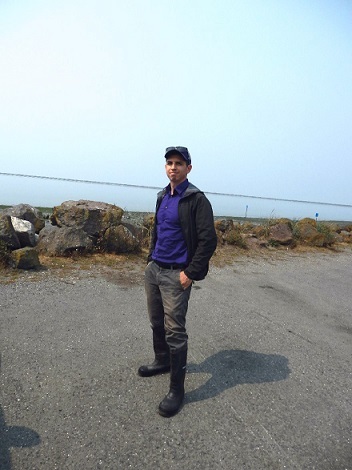 Meet Our Interns: Rico G.
My internship location is in Port Angeles, WA and I will be doing most of my work from the Clallam County Department of Health and Human Services. The building I’m in is located less than a mile from the beach and is surrounded by tall mountains and heavily wooded areas. My first day began with a 4 minute drive down to the work site and a meeting with my supervisor. My supervisor is the Environmental Health Director for all of Clallam County. They set me up with an office which serves as a great space for me to write blogs about my internship. For my first day, I tagged along with my colleague for some basic water sampling. This was a fun experience because we were able to take a short walk down to the beach and get into the water to take samples from multiple sites. I was also able to explore the lab on-site, where water testing is performed and inoculated samples are tested for contamination. It was nice to apply the skills I learned in university in an actual job setting. The rest of my day was spent doing online training for HR. So far the best thing I like about my workplace is the setting. The people here are relaxed and friendly but are also very skilled and knowledgeable. My location has a very small permanent population so the town itself isn’t much larger than UW campus. Port Angeles is within walking distance of Olympic National Forest, so there are many thriving businesses and amenities available for the tourists that come through every year. I’m most excited to be doing work around the beautiful forest itself. The services my colleagues and I will perform will send us across the almost 3,000 sq. miles of Clallam County. I am also excited to learn more about our role in helping the county function as a healthy entity. This entry was posted in Uncategorized and tagged 2018, Clallam County, internship on July 11, 2018 by deohsjob.